The last Jetta I drove was a 2001 (who’s engine had been replaced by VW under warranty due to an issue with the timing belt that broke). Volkswagen has come a long way in producing a vehicle that feels structurally more sound, has an engine that’s smoother, and with many of the quality issues reduced compared to 4-8 years ago. In addition, it’s wrapped in a more elegant body with an interior to match. The inline, 5-cylinder is smooth and provides adequate acceleration. It’s not a large engine (at 2.5 liters of displacement), but is responsive to throttle inputs. I was a bit surprised by the interior noise, but realize it’s a big resonating box when moving on the road. The utility value of the SportWagen is amazing. The second row seats have a similar feature to the Honda Fit in the seat cushions ability to lift and pivot forward providing a deeper floor for taller objects. With the cushions removed, the seatbacks will pivot completely forward providing a completely flat loading floor. The 6-speed Tiptronic transmission shifts smoothly and drops down to the right gears under hard acceleration. Overall, it’s an easy car to drive and park with excellent visibility all around compared to other taller CUVs or SUVs. The new Jetta SportWagen has typical German construction (although it’s assembled in Puebla, Mexico) with a stiff structure and well fitting panels. All doors, knobs, controls and displays exude quality. Surface textures are contiguous in the interior (dash, center console, and steering wheel). One cool little build/design feature is built into the halogen lights: there’s a small VW logo is incorporated in the bulb diffuser. Call me strange, but the first thing I noticed was the wide dead pedal providing a substantial platform for planting your left foot during aggressive turning. Looking around the cabin I like how the interior is laid out cleanly. The center console and dash have everything clearly labeled; the lettering becomes purple on black at night. The main controls for the air are dominated by three rotary knobs (temp, fan, and vent control). Above those controls are the a/c button as well as the rotary dials for the seat heaters. If you choose to close all or most of the dash vents facing the driver and passenger, you could open the vent at the center/ top of the dash for what VW calls “indirect cooling”. By having the cool air originate from the top of the dash and be diffused by the windshield, you’re not blasted by a stream of chilled air on your hands, arms or face. Using this vent (and closing the others) appeared to lengthen the time it took to cool the car versus using the normal dash vents. 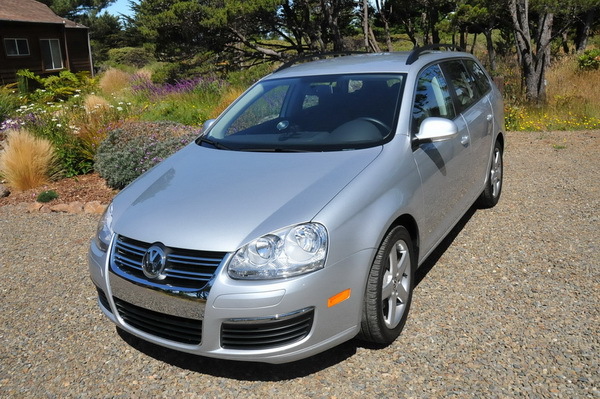 Equipped with the “Premium Audio System”, our SportWagen had upgraded components and the satellite options. For a mid-$20’s car, the sound system rocked producing detailed mids and highs with tight bass regardless of the volume (most cars have bass that muddies as the volume increases). The driver seat has three manual controls: pump lever for adjusting seat height, a seat back angle lever, and a rotating knob to adjust the location of the lumbar support. Even with these rudimentary controls, I was able to find a comfortable driving position that suited my body for 2-3 hours driving stints. Both front doors have storage pockets with the passenger pocket able to accommodate a large bottle. The Jetta deviates from the standard cruise controls on the steering wheel or right stalk in that it has it on the left stalk with a rocker switch at the end of the stalk. At first, I thought this was a strange location/design, but it actual use, it was very usable. When I wanted to speed up or slow down, I just hit the top or bottom of the switch with my left index or middle finger never having to actually remove my hands from the steering wheel.